The turboDial Hosted Voice upgrade gives you significant power to manage phone calls within your team. The Enhanced Inbound features provide more ways for multiple team members to receive and manage calls, and provide the capability to create Dashboard Reports for inbound calls similar to those you have for outbound calls. The Inbound Call Routing features include Voice Mail and Auto-Attendant so that your inbound calls to the right agent quickly and efficiently. The Call Handling features help your team work together to provide an outstanding customer experience. The SIP Device Support feature allows you to connect physical SIP phones and softphones to make and receive calls with turboDial. Softphone on your PC – You can already use your PC to make outbound calls. With Hosted Voice, you can also receive inbound calls at your PC. Forward to the Contact Owner – For inbound calls from known Contacts choose the softphone of the Contact Owner as one of the destination softphones to ring. Inbound Call Alerts – Screen Pops – Announces the call and provides caller name and number information. 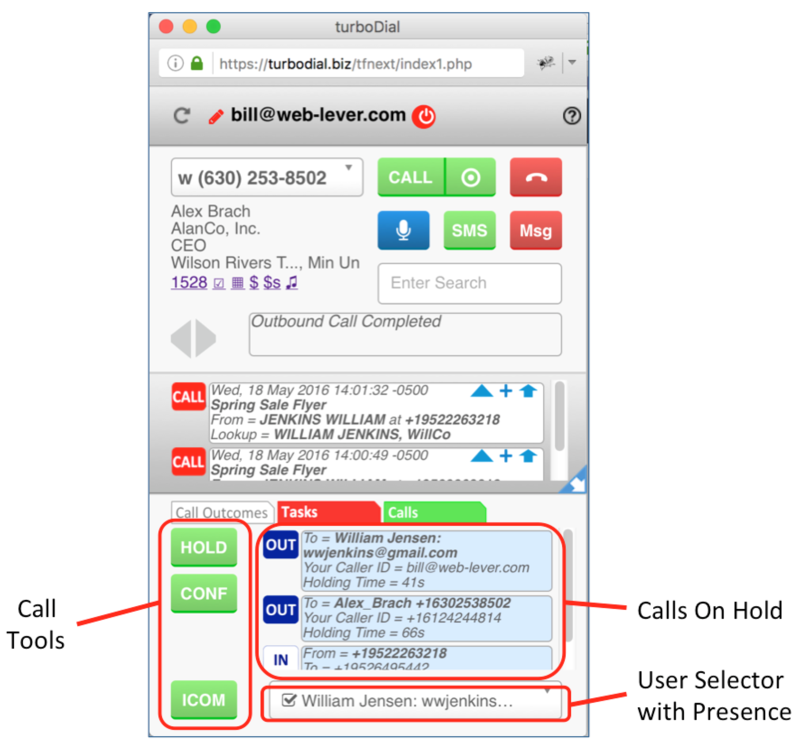 turboDial will also lookup and display the Infusionsoft contact name in the Screen Pop when you receive an inbound call. Time of Day Routing – Configure a number to forward inbound calls based on the time of day. Inbound Call Notes – For every call to your inbound numbers turboDial will create a Call Note, and if a match to an Infusionsoft Contact is found the Call Note will be automatically attached to it. Call Notes are valuable for your tracking and dashboard reporting purposes. Inbound Call Recording – You can configure any of your inbound numbers to record all calls that arrive inbound, and those recordings will be linked in the Call Note on the contact record just as they are for outbound calls. Text Message Alerts – Any inbound reply received in response to an SMS text message you sent outbound from turboDial will be displayed and chimed right on the turboDial panel of the User it is intended for. 2-Way Text Message Chat Window – The window you use to send an SMS text message can be left open and replies to your text will be displayed immediately in that window as they arrive. And you can keep several chat session windows open while you have multiple conversations going at the same time. Auto-Attendant – Automatically answer inbound calls and direct your callers to the people or resources they need. Auto-Attendant allows you to configure “extensions” to reach each team member, or play per-recorded messages as needed. Voice Mail – When an inbound call isn’t answered you can play a voice mail greeting and record the caller’s message. Voice Mail notifications are displayed on the turboDial panel, where they can be played back and deleted. Voice Mail notifications can also be sent via email. Find-Me – Setup calls to your inbound number to ring up to 10 phones in sequence. A call will begin by ringing the first phone number in the sequence, and if no answer then moves to begin ringing the second phone number and so on until every phone number has been rang. And Voice Mail can be configured on the final number so the call can be returned later. Inbound Call Queuing – When no phone agent is available to answer a call you can play a greeting to the caller and automatically move them to a queue where any agent can connect to the call when they free up. Auto-Greet Announcement – Automatically play an announcement, such as “This call is recorded for training purposes” to the caller for any of your Inbound Numbers. The Call Handling features allow you to leverage your entire team when a customer is on the line. Your agents can pause a call while they consult others or move a call to the best available agent and you’ll know that your team has the tools they need to close deals. These features apply to both Inbound and Outbound calls. Custom Hold Music – upload your own audio file to be played to your customers when they are placed on Hold, Park or into an Inbound Queue. Call Park – Place any call in a special hold queue (Parked Calls) that can be accessible to many or all of your agents, and any of those agents can bring the call back off Park and connect to it. 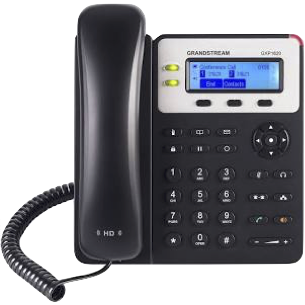 With Hosted Voice you can connect physical SIP phones and SIP softphones to make and receive calls using turboDial. When you add the Hosted Voice Upgrade to turboDial, your Additional Users and Add-on subscription fee will be changed. Hosted Voice is priced at $15/month for each User who is authorized to use turboDial on a PC/Mac. For example, if you have 3 total Users in turboDial (1 base and 2 additional) the Hosted Voice upgrade will increase your turboDial Additional Users subscription fee by $45.00 per month. The Enhanced Inbound group of features (described above) are a subset of Hosted Voice and are available as a separate Add-on. The Enhanced Inbound Add-on may be obtained if you need only those features, rather than the full set of Hosted Voice features. The Enhanced Inbound Add-on is priced at $10/month for each User who is authorized to use turboDial on a PC/Mac. The SIP Credentials feature is included in the price of Hosted Voice. However if you create more SIP Credentials than the number of Users who are authorized to use turboDial on a PC/Mac, then there is a charge of $5/mo for each SIP Credential that exceeds the number of Users. For example, if you have 5 User authorized to use turboDial on a PC/Mac and you create 5 SIP Credentials, then there is no extra charge. However, when you create the 6th Credential you will be charged $5/mo for that Credential.